Two U.S. Air Force B-52H Stratofortress bombers fly over the Pacific Ocean during a training mission on August 1, 2018. Two U.S. Air Force (USAF) B-52H Stratofortress long-range, heavy bombers and two U.S. Navy P-8A Poseidon maritime patrol aircraft conducted a training exercise in the vicinity of Japan over the East China Sea on August 1, Pacific Air Forces said in a statement last week. The main aim of the exercise was to improve combined and joint service interoperability. The joint drill was also meant to “demonstrate, though multi-service flight operations, the United States’ commitment to operating freely across the global commons,” according to U.S. Indo-Pacific Command (USINDOPACOM). Over the few last years, China and Russia have both stepped up their military presence in the East China Sea. The B-52H mission was flown in support of USINDOPACOM’s continuous bomber presence (CBP) mission in the Indo-Pacific region. “The routine employment of CBP missions in the USINDOPACOM area of responsibility are in accordance with international law and are vital to the principles that are the foundation of the rules-based global operating system,” the August 1 statement notes. The two B-52H bombers are part of an USAF contingent currently forward-deployed to Andersen Air Force Base on Guam in the Western Pacific. The USAF dispatched a total of six B-52Hs to the Pacific island in January to replace a unit of B-1B Lancer heavy strategic bombers. B-52Hs were last deployed to Guam in July 2016. The USAF has routinely been forward-deploying B-1B, B-52H, and B-2 Spirit bombers to Guam since 2004. Out of the three different bomber types, two of which — the B-52H and B-2 Spirit — are capable of carrying nuclear weapons. 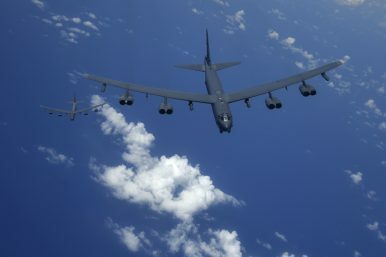 However, the two B-52H bombers operating over the East China Sea on August 1 are of part of the USAFs fleet of 41 B-52Hs that were denuclearized under the 2010 New Strategic Arms Reduction Treaty (START). The USAF operates a total of 58 B-52H bombers, which are capable of flying at high subsonic speeds at altitudes up to 50,000 feet (15,166.6 meters) and can carry nuclear cruise missiles and a conventional payload of up to 70,000 pounds (31,500 kilograms). The denuclearized variant of the B-52H carries JASSM [AGM-158B Joint Air-to-Surface Standoff Missile] and JASSM-ER [Extended-Range] long-range, radar-evading cruise missiles, whereas nuclear-capable bombers carry the nuclear-tipped AGM-86 air-launched cruise missile. US strategic bombers for the first time carried out a nighttime training mission with Japanese, ROK fighter Jets near Sea of Japan.